My girls are obsessed with all things bugs/insects lately. My oldest is always asking a million questions a day. How come some bees sting and some don't? Is that a honey bee? Why do they like flowers? To be honest I can't answer half her questions! "I wish I could be a honey bee for a day." I left this completely up to my girls to explore any way they wanted to. 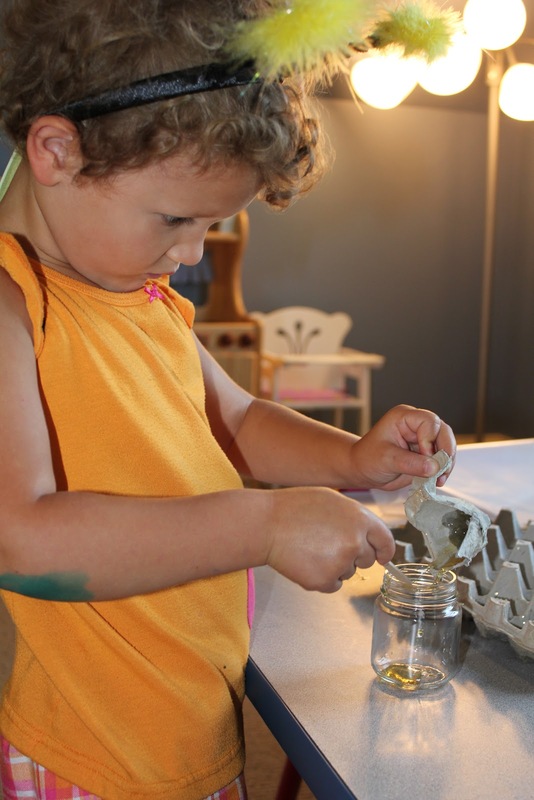 They started first by putting their nest (egg carton) "up high on the art table so no one would step on it"
My 27 Month old did not want to wear her wings and that is OK! My 27 Month old knew that the bees sucked it up from their mouth so she always put the back end of the baster up to her mouth. My oldest got a little frustrated with her baster so she asked for something else. I gave her a medicine dropper. Putting the "nectar" into the "honeycomb." My 27 Month old lost interest after a couple trips back and forth. My oldest declared me a "worker bee" and said "you need to squirt in some honey... but only where the nectar is, Mommy"
Doing her "busy bee dance" to show all the other bees where the flower patch is. Counting how many she has left to fill. My 27 Month old joined back in when she heard there was going to be honey tasting going on. Scrapping her honeycombs to put into jars. "Look at all this honey we made!" And of course the taste test! Did you borrow "Busy Buzzy Bee"? That has been a favorite in our house lately. Any other good bee book? I always love suggestions for the library! This looks like lots of fun! My son is very interested in "pollinators" from a tv show he saw on bees - I bet he'd love this. I'd love to hear which books you checked out from the library as well! Wow, this site continues to amaze me. I am really impressed with the imaginative and hands on learning you present to your children. 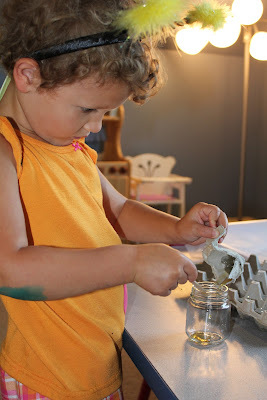 The idea of the invitation and allowing the children to create their own activity is a great concept. Children are so often boxed in by structure, structure, structure. While this is often necessary, especially in a school setting, you have taught your children the necessary safety precautions but do not limit their creativity or their explorations. I am looking forward to setting up invitations for my school-age children this summer and to seeing what they can gain from it! This is so perfectly appropriate - and BEAUTIFUL - that I almost wept. What a celebration of physics/nature/life/learning. Exquisite; love it. Absolutely LOVE this!! We're doing an insect theme at my preschool. The first week was general insects, this week we focused on Ladybugs (you can see some of our adventures in my latest blog post at: http://msbarbarasblog.blogspot.com/2013/03/ladybugs-keepin-it-real.html) Next week is caterpillars and butterflies and the last week of the month will be bees and ants. Can you tell me where you found the wings and antennas?